This song was written by American musician and (at that time) Roman Catholic priest Carey Landry. It was included in the recording Abba Father. An MP3 file is still available for purchase from OCP. Sheet music may be available in this songbook available from SheetMusicPlus - it's not 100% clear if it is contains all titles from the recording - but music books from the era usually did. Praise Him with blasts of the trumpet. 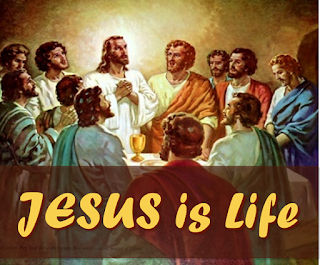 ... Jesus is life! Praise Him with clashing cymbals, ....Jesus is Life! Birds and living creatures, dance in praise of His name! Praise Him with clashing cymbals, ...Jesus is Life! Old men, and children too. ... Jesus is Life!